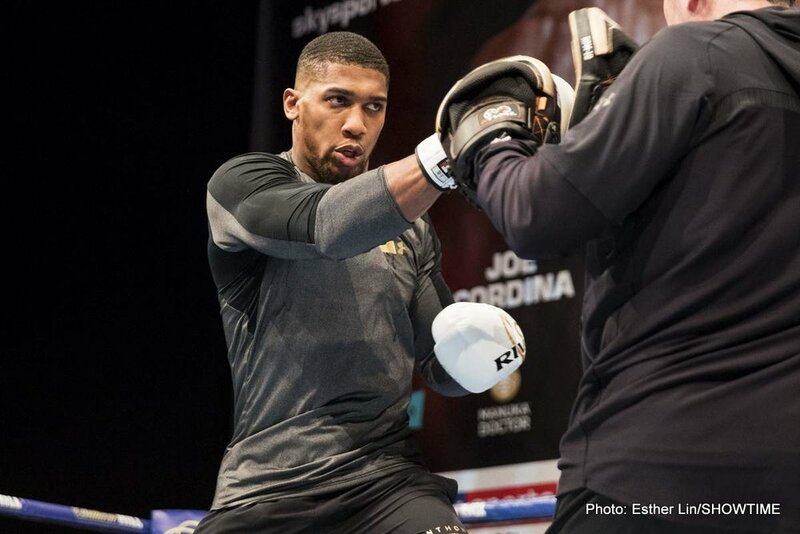 By Scott Gilfoid: Anthony Joshua is saying once again that he’ll give Deontay Wilder a flat fee to face him on April 13 in a heavyweight unification fight at Wembley Stadium in London, England. Joshua says he’s willing to give WBC heavyweight champion Wilder (40-0-1, 39 KOs) a guarantee of twice his highest pure with incentives if he faces him next April. Joshua (22-0, 21 KOs) says states that he’s going to get his hands on Wilder’s World Boxing Council title one way or another. Just how he’s going to do that without Wilder losing to someone else is the big question. Some boxing fans believe that Joshua’s sudden interest in talking up a fight between him and Wilder is all for show, as he clearly know that the American is planning on fighting rematch against Tyson Fury (27-0-1, 19 KOs) next in early 2019 to clear up their rematch 12 round split draw from their December 1 fight on SHOWTIME pay-per-view at the Staples Center in Los Angeles, California. By Joshua setting the April 13 date at Wembley Stadium, and telling the boxing fans that he absolutely wants the Wilder fight on that date, it gives the impression that he wants the fight. However, Joshua had a chance to fight Wilder in September, but he chose to quickly end the negotiations and fight 39-year-old Alexander Povetkin on September 22. Wilder had talked about wanting to get in the ring afterwards to try and sell his fight with Joshua, but he wasn’t allowed to do that for some reason. Things like that give the boxing public that Joshua isn’t serious about wanting to fight Wilder, and this latest challenge by him is just acting on his part. With Joshua setting a date on April 13 that Wilder won’t be available, it means he’s safe from having to fight him. “In April, he needs to make a decision whether he wants to step up and fight me in England,” Joshua said to DAZN about his desire to make a fight with Deontay Wilder on April 13. “That’s his decision, because he and [Tyson] Fury want a rematch. But if not, we got other options. No problem. The ball is in Wilder’s court. April 13 at Wembley, come see me. We’ll get the deal done. I’ll pay you way more than what you ever earned before. I’ll give you all the chance for 4 belts [IBF/IBO/WBA/WBO]. What more can you want?” Joshua said. ”He does,” Joshua said about Wilder deserving more than just a flat fee for a fight against him. ”That’s why we can say we’ll guarantee you a flat fee, and we’ll look at an upside as well. We’re going to give him a flat fee, which is going to get him interested, and we’re going to incentive-size him as well. So he can start running his mouth and promoting the fight like he does,” Joshua said. It’s alarming and pathetically sad that Joshua is still talking about wanting to offer Wilder just a flat fee for their unification fight. Hearn recently had distanced himself from the $15 million flat fee that he originally offered Wilder for a fight with Joshua in September. Hearn had been talking about wanting to give Wilder a percentage deal from 30 to 50% of the loot for a fight against Joshua. That’s why it’s shocking that Joshua is now talking of wanting to give Wilder just a flat fee for the April 13 fight. Joshua says he’ll add incentives for pay-per-view upside, which obviously means that if Wilder works his tail off in promoting the heck out of the fight, he can share in some of the upside. Just how much is unclear. Wilder being offered a flat fee in a fight that no one really knows how much it’ll generate sets him up to potentially get a really bad deal. For the sake of discussion, let’s pretend that Hearn’s new flat fee offer to Wilder is $20 million for the Joshua fight on April 13. So if the fight brings in well over $100 million, Wilder winds up with what amounts to be an 80-20 percentage deal. If the pay-per-view upside is around $5 million, then Wilder ends up with a 75-25 deal. In other words, Wilder would be the equivalent of one of Joshua’s mandatory challengers in terms of the percentage split he’d be getting for the fight. It’s obviously a great deal for Joshua, but a horrendous one for Wilder. Flat fee offers are made to fighters that aren’t popular. When you do see a flat fee offer made from one popular fighter to another, it’s usually a testing thing where the A-side guy makes a stab at tricking his opponent into taking a rotten deal. When you have two popular fighters, the logical deal that is made is a percentage deal that is close to being 50-50. If not 50-50, it’s 55-45. For Joshua to be still making Wilder flat fee offers at this point in the negotiations, it suggests that he’s not seriously interested in making that fight. Why else would Joshua give Wilder a flat fee offer. Even former World Boxing Organization heavyweight champion Joseph Parker was given a percentage deal for his fight with Joshua last March. If Parker is being given a percentage deal, then why isn’t Wilder for a fight that would generate far more money? Is it greed on Joshua and Hearn’s part or it simply a case of them going through the motions to make the boxing fans think they’re interested in a fight with Wilder on April 13, but in reality they’re not. ”How much did he generate? [for the Tyson Fury fight],” Joshua said. ”But how much did Wilder generate from that [325,000 pay-per-view buys]. I can do a million pay-per-view buys in London, but I’ve got to separate that pot between the undercard, the lighting, and the management. So that money gets divided. I want to know what Wilder put in his pocket, and we can double that,” Joshua said. It’s believed by some that Wilder’s fight against Fury brought in more money than any of Joshua’s past fights during his career. Even though Joshua has sold more pay-per-views for his fights, the cost is less than it is in the U.S. If Wilder vs. Fury went for around $80 on PPV per household, and Joshua’s fights go for around $20 per household PPV, then obviously the bigger money is coming from the Wilder-Fury fight, you would think. As such, Joshua talking about giving Wilder twice his highest purse in order to get him to accept his flat fee offer, it’s a waste of tie and breath on his part.